It's live now on test servers. PlayerUnknown’s Battlegrounds’ new map has been revealed. It’s a chilly, snow-themed island called Vikendi, bringing with it new weather, a new gun and the coolest way to get around a battlefield: snowmobiles. It’s already live on the PC test servers, so you can put on your woolly hat and scarf and jump in now. Vikendi, in terms of size and the type of battles it promotes, sits in the middle of Erangel and Sanhok. It’s big enough so that you can spread out and actually need to actively look for foes, instead of just bumping into them, but it’s got a faster pace than the biggest maps. The result is a map of contrasts, not just in terms of geography, but in architecture and tone, as well. Set in Eastern Europe, you’ll come across medieval castles and abbeys but, just down the road, more modern buildings. There’s a ‘60s cosmodrome, complete with rocket, and a even quirky dinosaur theme park. The dinosaur park, in particular, sounds like a brilliant, murderous arena. Some of PUBG Corp’s artists took a trip to Slovenia where they found a dinosaur park, inspiring the one in-game. It was more of a wilderness trail, however, while the PUBG version is a proper amusement park with a roller coaster and bumper cars. These are locations with personality, and they whisper about the lives people lead on the island before it was turned into a battle royale madhouse. While Curd knows what lead to all of these places, from Erangel to Vikendi, being in the state they’re in, he’s still keeping it to himself. There are regular towns and cities, too, created to thrust players into conflict more often. Their layouts funnel players into interesting conflicts, says Curd, and contrast with the likes of Miramar’s Los Leones. It’s a big city with loads of windows where it’s hard to predict where danger is going to come from. In Vikendi, there are fewer windows to cover and fewer lanes to watch, which the team hopes will conjure up plenty of head-to-head battles. Away from civilisation are dense forests and plenty of places to hide. The developers envision Vikendi as a squad map, where groups of players can find lots of cover behind walls, rocks and trees. If you don’t care about being spotted, however, you can throw caution to the wind and just speed around on the slippery, sliding snowmobile. PUBG’s newest vehicle is also its wildest, speeding across icy rivers and over snow-dappled hills. Regular skis probably wouldn't have fit PUBG, but a motorised bullet on skis? That's a different story. 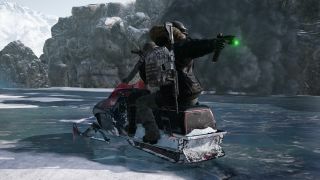 The weather doesn’t just make it possible to slide around on snowmobiles—it also affects visibility, like the weather on other maps, informing player tactics. When there’s heavy snow and visibility is low, or when it’s dark and the only obvious light is the Aurora Borealis, players might be more likely to lurk inside. Clearing buildings, then, becomes a priority, and so does finding the right loadout for the job. On clear days, however, snipers can find a comfy perch and start picking off targets. The snow also means that players leave tracks as they explore the island. Tracks that other players can use to hunt them down. The stalker/prey dynamic is a big part of Vikendi, says Curd. Like open doors and smashed windows, tracks in the snow can tell players to avoid an area if they don’t want a confrontation, or they can head in that direction if they do. And while an open door just means someone has been in that building at some point, tracks vanish over time, so if you do see them, a player has been in the area recently. They promote the kind of clever, stealthy play that, as a player who often feels like they’re in a stealth-horror game, make for the most memorable matches and encounters. You know there’s someone else nearby, but have they seen you yet? Do you have the drop on them, or are they hiding in a bush, grinning with ill intent? Probably the latter, knowing my luck. You can climb onto the roller coaster tracks and start taking potshots with your new G36C now by hopping onto the test servers, and Vikendi will be available on the live servers on December 19.